The race to make the first quantum computer is becoming as important as the race 75 years ago to get the first nuke. It could change the balance of power in politics and business. Quantum computers have long been theoretically possible but a kind of futuristic fantasy, likeInterstellar-style wormhole travel, or zero-calorie Hershey Bars. I first wrote in the 1990s about the quest for one. Now breakthroughs are coming faster, and scientists say we’re 15 to 20 years away from fully functional, programmable quantum computers. This technology will make the microprocessor in your laptop seem as sophisticated as a booger. The silicon-based technology inside today’s computers, which engineers have constantly made faster and cheaper for five decades, is running out of ways to get better. Quantum computers will herald, well, a quantum leap—like riding a horse one day and getting into a fighter jet the next. These machines will be millions of times more powerful than today’s fastest supercomputers, solving problems that now elude solving, like dead-on accurate weather prediction or modeling protein molecules for medical research. © Kim Stallknecht/The New York Times/Redux D-Wave Systems’ quantum computer processor is pictured without its protective thermal canisters at the company’s lab in Burnaby, British Columbia, Canada on March 11, 2013. A quantum computer could also create indestructible encryption, and unlock any existing computer security as easily as you unzip your fly. We’re entering an era of cyberwar, so imagine how power might shift if one country gets the ability to invade any other country’s computer systems while putting up the ultimate computer defenses. That’s a major reason nations are pouring money into this research. The U.K., China, Russia, Australia, Netherlands and other countries are in the game. In the U.S., the CIA, National Security Agency and Pentagon are all funding research, while Los Alamos National Laboratory operates one of the most significant quantum computer labs. Negotiations to keep nuclear weapons from Iran are certainly critical, but if you play out the promise of quantum computing, an American machine could bust into Iranian systems and shut down all that country’s nuclear activity in an instant. It’s like a game of rock-paper-scissors: Nukes might be the world’s version of a rock, but quantum computers would be paper, winning every time. And yet, quantum computing research isn’t self-contained and secretive in the manner of the Los Alamos atomic bomb work during World War II. Some of it is academic work at universities such as the Massachusetts Institute of Technology, with findings shared in scientific papers. Technology companies are working on this, too, since these things have the potential to be business nukes. IBM, Google and Microsoft all fund research. Imagine if Google gets one before Microsoft. That pesky Bing could wind up vaporized. Google has a Quantum Artificial Intelligence unit working with the University of California, Santa Barbara, with a goal of developing a quantum machine that can learn. Meanwhile, a Canadian startup, D-Wave Systems, is partially funded by Amazon CEO Jeff Bezos—and the CIA. The very secretive and often controversial company is already marketing a hybrid machine that seems to be a traditional silicon computer with some sort of quantum turbo thruster. Keep in mind that this technology is really hard, and really, really weird. A quantum computer makes calculations using the spin of special atoms, called qubits, and it relies on bizarre quantum physics properties like multiple parallel universes. Quantum computing is so fast because it calculates all possible answers at the same time. To borrow a metaphor from D-Wave CEO Vern Brownell, let’s say you had to find an X written on one page among the 37 million books in the Library of Congress. A typical computer today would look at every page, one at a time—very quickly, but still in a serial process. A quantum computer could look at every page at the same time—as if it were splitting the task into a billion parallel universes, finding the answer, then coming back to ours to show us where that X is. Scientists have managed to get a few qubits to do calculations in labs, but we are far from getting a stable, programmable, fully quantum machine. On April 29, IBM announced what it says is a significant advance—a way to detect and measure the two types of quantum errors, called bit-flip and phase-flip, at the same time. That sounds esoteric to most of us, but it will help with a peculiar problem that vexes researchers: The very act of looking at a qubit to get its answer can make the qubit change its answer. So some mechanism needs to figure out whether we’re seeing the right answer. Again—this stuff is really weird. The various labs often disagree on the best way to build a quantum computer, and the art of programming qubits is as big a challenge as making the machine in the first place. Today’s software is based on algorithms, which are linear, one-step-at-a-time calculations. Top mathematicians aren’t yet sure how to write algorithms that calculate everything at the same time. It’s like trying to come up with a recipe for an apple pie in which all the ingredients combine in the pan in the same split second. Yet hard as this work seems, scientists have become sure that the first quantum computers are within reach. 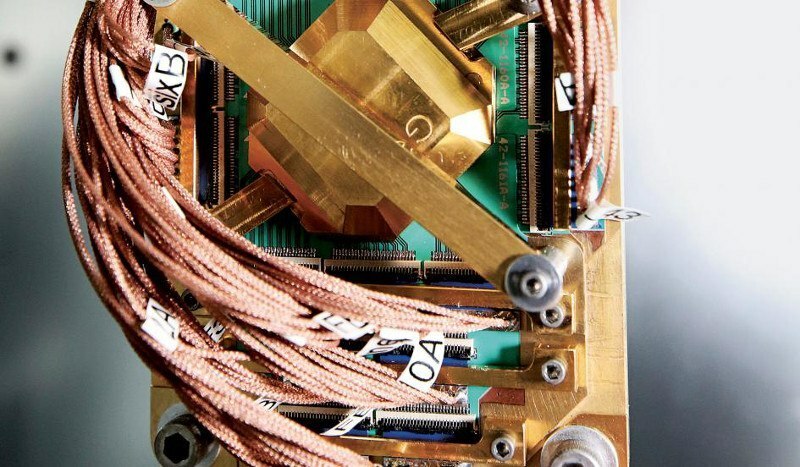 Expect quantum computing news to keep coming. And it might not be too early to prepare for quantum-era life a couple decades from now. If you’re already worried that artificial intelligence will take your job, quantum AI will seem terrifying. Your Google self-driving car will be smarter than your whole department.